A Stunning shot of Yandabo Pottery Village taken by Saw Yan Naing, a waiter on board the RV Kha Byoo Pandaw capturing the spirit of this picturesque but intensely practical place. Yandabo is famous (or notorious!) in Burmese history as the place where the treaty was signed that recognised Britain's first colonial encroachment as it was the Treaty of Yandabo that ended the First Anglo-Burmese War of 1826. 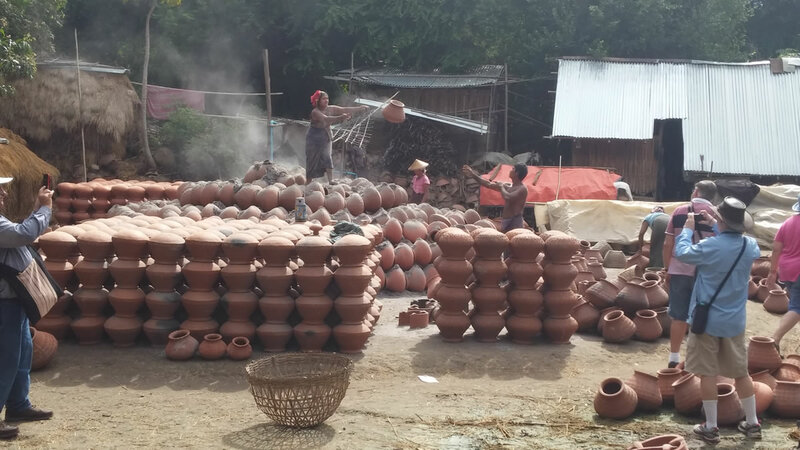 Nowadays it is best known as Burma's premium pottery-making centre, and out of the population of 105 families - about 800 people in total - the vast majority are involved in ceramic production. Yandabo supports itself exclusively on the making and selling of these iconic, functional works, their design refined over centuries of rural craftsmanship. To accompany his stunning photo, Mr Saw has provided us with fascinating detail about Yandabo's working practices: Dry clay powder is made out of Yandabo's special riverine soil, to which is added the water that makes soft clay. From lumps of this clay thrown on their busy potters' wheels come the fabulous water pots, vases and other household items for which Yandabo is famous. As this amazing photo shows these clay pots are left to dry out in the sun for about 3 to 4 days. Then they are gently fired in giant piles of ash and straw for 72 hours, before being transported to many villages and towns down the river by Burma's great arterial highway, the Irrawaddy river. It has been observed that women do the bulk of the work, while the men sat around gossiping. In fact, the men do the dirty work – digging the clay-rich soil from the riverbank. To find out more about visiting the stunning Yandabo Pottery Village try out our new PAGAN AND THE UPPER IRRAWADDY expedition.